Longitudinal section of a digit showing the dorsal nail apparatus (top). Component part of the nail apparatus (bottom). Performing successful nail surgery requires a comprehensive understanding of nail anatomy and physiology. [6, 7] An understanding of both the vascular and neural pathways supplying the nail complex and the functions and relationship of each component of the nail unit is also essential. Thus, the nail surgeon should be equipped with knowledge of nail pathology, surgical techniques and instrumentation, anesthesia, preoperative evaluation, management of complications, and wound care and healing after surgery. This knowledge ensures minimal patient discomfort, maximal patient satisfaction, and optimal surgical success. With these goals in mind, this article reviews the nail anatomy and focuses on common nail pathologies with the corresponding surgical techniques used for their diagnosis and treatment. Multiple indications for surgical exploration of the nail unit exist; most of the indications range from infectious and inflammatory to neoplastic and traumatic causes. Some commonly encountered disease processes affecting the nail complex include onychomycosis (ie, fungal infection), onychocryptosis (ie, recalcitrant ingrown nails), onychogryphosis (ie, hornlike hypertrophy of the nail plate), and onychauxis (ie, thickened nails), as well as psoriasis, lichen planus, congenital nail dystrophies, and tumors. In addition, nail surgery is frequently performed to aid in a suspected diagnosis, to relieve pain, and to correct or prevent anatomical deformities of the nail. Acute paronychia is an acute inflammation of the nail fold and frequently results from minor trauma, such as an accidental break in the skin, a splinter in the distal edge of the nail, a thorn in the lateral groove, a hang nail, or excessive nail biting leading to infection of the surrounding soft tissues. [1, 8, 9] The infectious process initiates in the lateral perionychium and is followed by the development of erythema, intense inflammation, swelling, pain, and local tenderness. While the timing of the presentation may vary, it is often 2-5 days after the initial trauma. Vesicles and blisters may also form. In onychocryptosis, the primary direction of nail growth is lateral instead of the normal, forward orientation of nail growth in the longitudinal plane. A more pronounced transverse curvature of their toenails increases the likelihood of developing ingrown toenails. The laterally curved edge of the nail plate, or the nail spicule, penetrates the adjacent LNF, perforating the fold skin and the surrounding dermal components. Perforation of the lateral fold skin results in painful inflammation that manifests clinically as mild edema, erythema, and pain. In advanced stages, drainage, infection, ulceration, and hyperhidrosis may be present. Hypertrophy of the lateral nail wall occurs, and granulation tissue forms over the nail plate and the nail fold during healing of the ulcerated skin. The resulting edema further exacerbates the problem by compressing the lateral dermal tissue between the sharp nail plate and the bony phalanx. Myxoid cysts are dome-shaped, translucent, solitary nodules occurring on the dorsal aspect of the finger. [13, 16, 17] Occasionally, the toes may develop these cysts in a similar location. Typically, the cysts are lateral to the midline between the PNF and the distal interphalangeal (DIP) joint. The cysts measure 4-10 nm in diameter and result in a longitudinal depression in the nail plate, as a result of pressure on the matrix. Their pathogenesis and etiology have not been clearly established. Myxoid cysts occurring on the DIP joint have been associated with the formation of a tract or communication with the joint. The cysts are believed to occur secondary to degenerative disease of the DIP joint and in association with marginal osteophytes, thus explaining their presence in patients with osteoarthritis. [13, 19] As a result, myxoid cysts are frequently mistaken for synovial cysts. Myxoid cysts of the PNF may result from increased synthesis of hyaluronic acid by local fibroblasts. [13, 20] Whether or not these mechanisms of cyst formation occur is controversial. In the absence of fissuring, periungual warts are usually asymptomatic. Subungual warts initially infect the hyponychium, gradually move toward the nail bed, and lastly involve the nail plate. They commonly cause pain. Typically, the nail plate is spared, except for ridging that occurs on the surface of the nail plate. Common warts under the proximal nail fold cause a swelling, similar to chronic paronychia. Common warts in the posterior nail fold may exert pressure on the matrix, resulting in a deformed nail plate. If left alone, periungual and subungual warts tend to linger and persist as they continue to grow and invade the skin of the other neighboring digits. Traumatic injuries of the nail unit include simple or complex lacerations, crush injuries, avulsions, terminal phalanx fractures, and partial or complete hematomas. Preservation of nail structure and function is the most important consideration when managing injuries to the nail complex. To ensure optimal management in cases of nail unit trauma, early treatment of the patient should be initiated. The goal is to explore and repair the wound within hours or days of the injury. Sometimes, the wound is still capable of repair 1-2 weeks following the injury. Acute subungual hematoma frequently results from blunt trauma to the underlying vascular nail bed. Subungual hematoma may result from chronic repeated injury to the nail caused by minor trauma, such as trauma of the toenail from poorly fitted shoes. They may also occur in older patients with atrophy of the skin and nails. Bleeding ensues, and the accumulated blood is limited to the subungual compartment of the nail unit. A hematoma develops and is accompanied by inflammation and severe pain due to increased pressure of the entrapped blood on the subungual tissue and underlying periosteum. When acute subungual hematomas are directly under the transparent nail, they have an immediate onset and are conspicuous. In acute subungual hematoma, the nail color is initially red and changes to black after coagulation. The hematoma is uniform in color with sharply demarcated margins, and it usually grows distally with the nail plate until reaching the free distal edge of the plate where it is no longer seen. Occasionally, the hematoma may persist under the nail and does not move distally with nail growth. Hemorrhages resulting from trauma to the dorsal nail fold may not appear with forward nail growth for several days. The differential diagnosis of subungual hematoma should include melanoma, glomus tumor, Kaposi sarcoma, basal cell carcinoma, squamous cell carcinoma (SCC), exostosis, melanonychia striata, fungal melanonychia, and keratoacanthomas, all of which must be excluded. To exclude a diagnosis of melanoma, biopsy must be performed in all pigmented lesions of unknown etiology. Simple superficial lacerations of the nail are usually confined to the nail plate, nail bed, and LNFs. Complex lacerations involve the nail matrix and PNF and result in partial or total nail avulsion or fragmentation of the nail plate; in complex avulsive lacerations, the finger pulp, nail bed, and distal phalanx are destroyed. Complex lacerations may lead to serious complications after injury and should be promptly treated to prevent abnormal nail morphology and function. A major function of the distal phalanx is to support the distal soft tissues of the finger. Fracture of the distal phalanx occurs in approximately one half of nail bed injuries. The type of fracture (open vs closed),  the position of the fracture, and the extent of comminution determine treatment. Healing of the fracture is mostly related to the degree of initial displacement and soft tissue injury. Most commonly, trauma or certain disease processes easily injure the small, fine capillaries that line the epidermal-dermal ridges on the nail bed. [1, 8] Splinter hemorrhages result from the extravasation of blood into the potential space between the nail plate and the nail bed after capillaries are disrupted. They develop in the long axis of the nail bed, which conforms to the orientation of the dermal ridges and the subungual vessels. Other etiologic factors are associated with the formation of splinter hemorrhages in the nail bed; the hemorrhages may clinically occur in such conditions as psoriasis, vasculitis, bacterial endocarditis, arterial embolism, lupus, Darier disease, cirrhosis, hemochromatosis, thyrotoxicosis, and trichinosis. [1, 8, 25] Certain drugs (eg, tetracycline) and drug reactions may also induce their formation. The hemorrhages may be single or multiple, and they appear as brown, red, or black linear streaks, usually in the distal one third of the nail. As the nail grows, the hemorrhages move distally and superficially. They do not tend to blanch on palpation of the nail plate. Splinter hemorrhages that occur proximally near the lunula are frequently associated with systemic disease. Involvement of multiple nails by these hemorrhages may indicate the presence of an underlying systemic disease. Overall, splinter hemorrhages occur most often in males and in blacks. They commonly involve the thumb and index finger of the dominant hand. However, in studies with single and multiple hemorrhages, the left thumb was found to be the most frequently involved digit. High-resolution MRI gained prominence in the noninvasive diagnosis of nonmelanoma nail tumors and is capable of detecting lesions that are smaller than or equal to 1 mm in diameter. This modality is helpful in identifying lesions in the following presentations of benign and malignant tumors of the nail: glomus tumors, periungual fibromas or fibrokeratomas, mucous cysts, and exostoses. Pyogenic granuloma is a benign granulomatous lesion commonly seen after a minor trauma penetrates the skin. It usually starts as a small, red papule on the PNF and rapidly grows to the size of a pea. [8, 11] Pyogenic granuloma may also localize to the nail bed after a trauma penetrates the overlying nail plate. Erosion of its surface by pressure necrosis of the overlying epidermis may occur. Various types of fibroadenoma may occur in the periungual or subungual region. They are usually distinctive in their etiology and presentation. Subungual exostoses are painful outgrowths of healthy bone or remnants of calcified cartilage that frequently occur on the great toe in young persons. [8, 11] Subungual exostosis is not a true tumor. Trauma has been implicated as the inciting cause. The exostosis begins as a small elevation on the dorsal surface of the terminal phalanx. Over time, it may appear as an outgrowth under the distal nail edge, or it may completely destroy the nail plate, creating an environment for tissue erosion and infection. Clinically, patients present with pain that may be accompanied by an abnormal gait because of difficulty walking and a deformed nail. The differential diagnosis includes osteochondroma, which has a similar presentation. The shape of the nail plate largely conforms to the convexity of the distal margin of the lunula, the visible crescent-shaped distal segment of the matrix. The nail plate exhibits a thickness gradient with the nail thickness, increasing proximally to distally and with age. Thus, the nail plate tends to be thinner at the lunula. [1, 4, 5, 31] Nail thickness is directly related to the length of the matrix. [1, 29] In darkly pigmented persons, a hyperplasia of melanocytes is commonly seen throughout the matrix epithelium, resulting in longitudinal linear bands of light brown to black pigment visible through the nail plate. [1, 29, 32] Although the linear bands of pigment may represent pathological states, they may be a normal finding in people of color, secondary to hyperproduction and accumulation of melanin. The solehorn is the ventral cuticle layered between the ventral nail plate and the distal nail bed; it functions as a potential waterproof barrier. in the space created by its firm attachment to the nail plate and the distal bed epithelium. In this capacity, the solehorn prevents the entrance and invasion of offending organisms and, therefore, protects the nail plate from infection (eg, distal subungual onychomycosis). Frequent aggressive manicuring of the hyponychial area results in disruption of this barrier and allows microbes to enter it. The PNF is a continuation of the dorsal skin of the digit that folds back on itself at the nail root to create 2 epithelial surfaces: a superficial dorsal layer and a deep ventral layer. [3, 4, 5, 14] The ventral layer travels to the base of the nail plate to create the nail matrix. Thus, the PNF obscures most of the nail root (germinal matrix) and the area where the proximal nail plate embeds itself into the proximal groove. The PNF is contiguous with the LNFs that border the nail plate. Where the 2 epithelial surfaces meet, the cuticle converges onto the distal nail plate. [3, 4, 5] The cuticle is the horny end product of the PNF, adhering to the dorsal wall of the nail plate. It is the true nail vest that appears as a fine white band. The role of the cuticle is similar to that of the solehorn; it functions as an impermeable barrier, sealing off the potential area that exists between the PNF and the nail plate. Eventually, the cuticle is shed like the cornified horny layer of epidermal skin. The nail matrix is the germinative portion of the nail complex, giving rise to the nail plate. [1, 4, 5, 11, 29] The matrix is at the most proximal point of the nail bed and is seated deep beneath the PNF; it is separated from the distal phalanx by only a few millimeters. According to Zaias, "the top half of the nail plate (the dorsal aspect) is derived from the proximal matrix, while the derivation of the lower half (the ventral aspect) is from the distal matrix." The proximal matrix continues proximally and laterally to form the lateral matrix horn. The nail surgeon should be cognizant that the lateral matrix horn may be extensive. The lunula is an opaque, grayish white, half-moon–shaped structure that extends beyond the distal limit of the PNF. The lunula is usually seen through the transparent nail plate, especially on the thumbs and great toes, as the visible distal component of the nail matrix. [1, 4, 5, 11] The distal margin of the lunula must always be preserved during nail surgery if the normal shape of the nail is to be maintained [1, 13, 29] An active granular layer typically found in the PNF is missing from the nail matrix; therefore, keratohyaline granules cannot be found in the matrix. The basal cells of the matrix actively participate in the process of differentiation and keratinization to eventually produce the dead horny product, the nail plate. The matrix is the center of nail formation and the source of the nail plate. The shape of the distal border of the lunula determines the shape of the nail. If this border is convex, the distal free edge of the plate will also be convex. The nail bed is the sterile component of the nail unit and the primary site of nail keratinization. [4, 5] The nail bed extends from the distal lunula to the point of origin of the hyponychium. 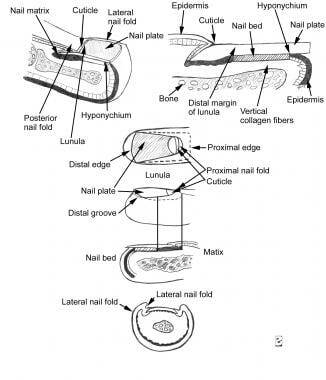 It shares similar boundaries with the nail plate, with the lunula marking the proximal border of the nail bed, with the lateral folds marking the lateral border, and with the hyponychium marking the distal border. The nail bed is a highly vascular structure that lacks an underlying subcutaneous layer of adipose tissue. As a result, nothing separates the dermis from the periosteum of the distal phalanx. The lack of this layer becomes apparent when one is confronted with aggressive tumors of the nail because such tumors may easily extend to involve the underlying bone. The connective tissue of the dermis, the dermal collagen, contains a balanced mixture of lymphatics, blood vessels, and elastic fibers. The dermis also has a wealth of glomus bodies and a rich capillary network longitudinally oriented with the parallel ridges. Splinter hemorrhages of the nail plate form when a small amount of blood leaks from the capillary bed into one of these folds and becomes trapped by the nail plate. Melanocytes are not found in the nail bed, although they are present in significant numbers in the matrix. An abundantly rich arterial and capillary vascular network supplies the nail unit. The ulnar and posterior tibial arteries divide into the proper palmar and plantar digital arteries, respectively. The two digital arteries, which occupy the lateral and medial aspects of the digit, form a cruciate anastomosis at the level of the deep dermis in the ventral pulp space. Upon anastomosing on the volar aspect of the terminal phalanx, the two arteries contribute branches to a superficial arcade and the underlying phalangeal periosteum. The superficial arterial arcade, which also receives a contribution from a vessel coursing dorsally over the DIP joint, supplies the PNF, including the capillary loops of the nail fold and the nail matrix. The digital arteries continue around the waist of the terminal phalanx and onto the dorsal surface where they divide near the DIP joint to form the dorsal and ventral arches supplying the nail bed and the nail matrix. The dorsal arch courses dorsally over the DIP joint where it terminates in an anastomosis with the proximal arch to supply the matrix and the PNF. The capillary loop system in the PNF is derived from the anastomosis between the two arches. [1, 8, 29] Therefore, perfusion of the nail matrix comes from two arterial systems: the superficial arcade and the proximal arcade. Anatomically, the superficial arcade sits at the base of the PNF, while the proximal arcade lies deep to the matrix. The ventral or distal branch supplies the remainder of the nail unit, specifically its most distal aspect, including the fingertips. The nail apparatus is also richly innervated by a complex neural system allowing tactile sensitivity and sensory discrimination. Anatomically, the laterally positioned digital nerves and their divisions nearly parallel the vascular supply to the nail unit. Specifically, there are two dorsal and two volar digital nerves, and the first through fifth digits are innervated by the dorsal nerves, whereas the second through fourth digits are innervated by the volar nerves. Relative contraindications to performing surgery in the nail unit include the presence of established peripheral vascular disease, collagen vascular disease, diabetes mellitus, and disorders of hemostasis. Patients presenting with acute infection or inflammation of the nail unit, including the surrounding paronychial tissues, are considered to have relative contraindications to nail surgery. When possible, surgery in these patients should be postponed until the acute event has resolved. When administering anesthetic for nail surgery, the use of epinephrine should be avoided or cautiously used in patients with a history of thrombotic or vasospastic disease such as thromboangiitis obliterans, Raynaud disease/phenomenon, or severe peripheral vascular disease. [34, 35] Epinephrine has vasoconstricting properties, and it has been associated with necrosis and poor wound healing of tissues. However, these complications appear to be mostly theoretical and have rarely been noted to occur in practice. Wilhelmi et al performed an extensive review of the medical literature and found no reports of epinephrine as a primary cause of ischemic necrosis or finger gangrene when appropriately mixed with lidocaine for digital block. The authors confirmed this finding when they performed 23 digital blocks with 1% lidocaine with 1:100,000 and 1:200,000 epinephrine. They recommend the use of epinephrine as an adjunctive component to help augment the effect of the local anesthetic, decreasing the total amount of anesthetic required and lowering the risk of toxicity. During nail surgery, the application of a tourniquet at the base of the digit allows the surgeon to operate in a bloodless surgical field. However, to avoid complications such as vascular compromise of the extremity, the use of a tourniquet for more than 15 minutes should be avoided. Optimal hemostasis is achieved when the tourniquet is applied for a maximum period of 15 minutes during the most critical part of the surgery. Zaias N. The Nail in Health and Disease. Norwalk, Conn: Appleton & Lange; 1990. Scher RK. The nail. Roenigk RK, Roenigk HH, Ratz JL, eds. Dermatologic Surgery-Principles and Practice. New York, NY: Marcel Dekker; 2006. 281-88. Fleckman P. Basic science of the nail unit. Scher RK, Daniel CR, eds. Nails: Therapy, Diagnosis, Surgery. Philadelphia, Pa: WB Saunders; 2005. 37-54. Dawber RP, Baran R. Structure, embryology, comparative anatomy, and physiology of the nail. Baran R, Dawber RP, eds. Diseases of the Nails and their Management. Oxford, England: Blackwell Science; 1994. 1-24. Dawber RP, Baran R, Berker D. Science of the nail: gross anatomy. Baran R, Dawber RP, eds. Diseases of the Nails and their Management. Oxford, England: Blackwell Science; 1994. 1-34. Haneke E. Surgical anatomy of the nail apparatus. Dermatol Clin. 2006 Jul. 24(3):291-6. [Medline]. Dawber RP, Baran R. Diseases of the Nail. Oxford, England: Blackwell Science; 1994. Ceilley RI, Collison DW. Matricectomy. J Dermatol Surg Oncol. 1992 Aug. 18(8):728-34. [Medline]. Shafritz AB, Coppage JM. Acute and chronic paronychia of the hand. J Am Acad Orthop Surg. 2014 Mar. 22(3):165-74. [Medline]. Pardo-Castello V, Pardo O. Diseases of the Nails. Springfield, Ill: Charles C Thomas; 1960. Relhan V, Goel K, Bansal S, Garg VK. Management of chronic paronychia. Indian J Dermatol. 2014 Jan. 59(1):15-20. [Medline]. [Full Text]. Salasche SJ. Surgery. Scher RK, Daniel CR, eds. Nails: Therapy, Diagnosis, Surgery. Philadelphia, Pa: WB Saunders; 2005. 326-49. Siegle RJ, Swanson NA. Nail surgery: a review. J Dermatol Surg Oncol. 1982 Aug. 8(8):659-66. [Medline]. Richert B. Surgical management of ingrown toenails - an update overdue. Dermatol Ther. 2012 Nov-Dec. 25(6):498-509. [Medline]. Miller PK, Roenigk RK, Amadio PC. Focal mucinosis (myxoid cyst). Surgical therapy. J Dermatol Surg Oncol. 1992 Aug. 18(8):716-9. [Medline]. Norton LA. Tumors. Scher RK, Daniel CR, eds. Nails: Therapy, Diagnosis, Surgery. Philadelphia, Pa: WB Saunders; 2005. 262-75. Haneke E. Nail surgery. Clin Dermatol. 2013 Sep-Oct. 31(5):516-25. [Medline]. Baran R, Bureau H. Surgical treatment of recalcitrant chronic paronychias of the fingers. J Dermatol Surg Oncol. 1981 Feb. 7(2):106-7. [Medline]. Johnson WC, Graham JH, Helwig EB. Cutaneous myxoid cyst. A clinicopathological and histochemical study. JAMA. 1965 Jan 4. 191:15-20. [Medline]. Al-Qattan MM, Helmi AA. Chronic hand infections. J Hand Surg Am. 2014 Aug. 39(8):1636-45. [Medline]. Samman PD. Tumors producing nail disorders: benign tumours. The Nails in Disease. Boston, Mass: Butterworth-Heinemann; 1994. 169-82. Clark RE, Madani S, Bettencourt MS. Nail surgery. Dermatol Clin. 1998 Jan. 16(1):145-64. [Medline]. Coyle MP Jr, Leddy JP. Injuries of the distal finger. Prim Care. 1980 Jun. 7(2):245-58. [Medline]. Daniel RC, Sams MW, Scher RK. Nails in systemic disease. Scher RK, Daniel CR, eds. Nails: Therapy, Diagnosis, Surgery. Philadelphia, Pa: WB Saunders; 2005. 219-50. Alam M, Scher RK. Current topics in nail surgery. J Cutan Med Surg. 1999 Oct. 3(6):324-35. [Medline]. Herndon JH, Myers SR, Akelman E. Advanced surgery. Scher RK, Daniel CR, eds. Nails: Therapy, Diagnosis, Surgery. Philadelphia, Pa: WB Saunders; 2005. 350-62. Paliogiannis P, Trignano E, Trignano M. Surgical management of the glomus tumors of the fingers: a single center experience. Ann Ital Chir. 2011 Nov-Dec. 82(6):465-8. [Medline]. Miller PK, Roenigk RK. Diagnostic and therapeutic nail surgery. J Dermatol Surg Oncol. 1991 Aug. 17(8):674-80. [Medline]. Gonzalez-Serva A. Structure and function. Scher RK, Daniel CR, eds. Nails: Therapy, Diagnosis, Surgery. Philadelphia, Pa: WB Saunders; 2005. 12-31. Fleegler EJ. A surgical approach to melanonychia striata. J Dermatol Surg Oncol. 1992 Aug. 18(8):708-14. [Medline]. Jellinek NJ, Vélez NF. Nail surgery: best way to obtain effective anesthesia. Dermatol Clin. 2015 Apr. 33 (2):265-71. [Medline]. Krunic AL, Wang LC, Soltani K, Weitzul S, Taylor RS. Digital anesthesia with epinephrine: an old myth revisited. J Am Acad Dermatol. 2004 Nov. 51(5):755-9. [Medline]. Wilhelmi BJ, Blackwell SJ, Miller J, Mancoll JS, Phillips LG. Epinephrine in digital blocks: revisited. Ann Plast Surg. 1998 Oct. 41(4):410-4. [Medline]. Sylaidis P, Logan A. Digital blocks with adrenaline. An old dogma refuted. J Hand Surg [Br]. 1998 Feb. 23(1):17-9. [Medline]. Richert B. Basic nail surgery. Dermatol Clin. 2006 Jul. 24(3):313-22. [Medline]. Scher RK, Ackerman AB. Subtle clues to diagnosis from biopsies of nails. The value of nail biopsy for demonstrating fungi not demonstrable by microbiologic techniques. Am J Dermatopathol. 1980 Spring. 2(1):55-7. [Medline]. Scher RK, Ackerman AB. Subtle clues to diagnosis from biopsies of nails. Histologic differential diagnosis of onychomycosis and psoriasis of the nail unit from cornified cells of the nail bed alone. Am J Dermatopathol. 1980 Fall. 2(3):255-6. [Medline]. Grover C, Nanda S, Reddy BS, Chaturvedi KU. Nail biopsy: assessment of indications and outcome. Dermatol Surg. 2005 Feb. 31(2):190-4. [Medline]. Clark RE, Tope WD. Nail surgery. Wheeland R, ed. Cutaneous Surgery. Philadelphia, Pa: WB Saunders; 1994. 375-402. Siegle RJ, Stewart R. Recalcitrant ingrowing nails. Surgical approaches. J Dermatol Surg Oncol. 1992 Aug. 18(8):744-52. [Medline]. Rich P. Nail biopsy. Indications and methods. J Dermatol Surg Oncol. 1992 Aug. 18(8):673-82. [Medline]. Scher RK. Biopsy of the matrix of a nail. J Dermatol Surg Oncol. 1980 Jan. 6(1):19-21. [Medline]. de Berker DA, Dahl MG, Comaish JS, Lawrence CM. Nail surgery: an assessment of indications and outcome. Acta Derm Venereol. 1996 Nov. 76(6):484-7. [Medline]. Dawber RP, Baran R. Nail surgery. Samman PD, Fenton DA, eds. The Nails in Disease. Boston, Mass: Butterworth-Heinemann; 1994. 209-21. Haneke E. Personnal communication on the management of large pigmented bands of the nail apparatus. 2004. Zaias N. The longitudinal nail biopsy. J Invest Dermatol. 1967 Oct. 49(4):406-8. [Medline]. Snow SN, Zweibel S, Lo JS. Rapid atraumatic nail plate removal using the cordless cautery unit. J Dermatol Surg Oncol. 1992 Apr. 18(4):322-6. [Medline]. Berritto D, Iacobellis F, Rossi C, Reginelli A, Cappabianca S, Grassi R. Ultra high-frequency ultrasound: New capabilities for nail anatomy exploration. J Dermatol. 2017 Jan. 44 (1):43-46. [Medline]. Singh R, Bryson D, Singh HP, Jeyapalan K, Dias JJ. High-resolution ultrasonography in assessment of nail-related disorders. Skeletal Radiol. 2012 Sep. 41 (10):1251-61. [Medline]. Lai WY, Tang WY, Loo SK, Chan Y. Clinical characteristics and treatment outcomes of patients undergoing nail avulsion surgery for dystrophic nails. Hong Kong Med J. 2011 Apr. 17(2):127-31. [Medline]. Han D, Li QF. New technique for non-microsurgical reattachment of avulsed fingertips in adults. J Plast Surg Hand Surg. 2010 Nov. 44(4-5):204-8. [Medline]. Bureau H, Baran R, Haneke E. Nail surgery and traumatic abnormalities. Baran R, Dauber RP, eds. Diseases of the Nail and Their Management. Oxford, England: Blackwell Scientific; 1994. 345-415. Scher RK. Surgical avulsion of nail plates by a proximal to distal technique. J Dermatol Surg Oncol. 1981 Apr. 7(4):296-7. [Medline]. Scher RK. Nail surgery. Epstein E, Epstein E JR, eds. Techniques in Skin Surgery. Philadelphia, Pa: Lea & Febiger; 1970. 164-70. Baran R. Surgery of the nail. Dermatol Clin. 1984. 2:271. White MI, Clayton YM. The treatment of fungus and yeast infections of nails by the method of "chemical removal'. Clin Exp Dermatol. 1982 May. 7(3):273-6. [Medline]. Averill RW, Scher RK. Simplified nail taping with urea ointment for nonsurgical nail avulsion. Cutis. 1986 Oct. 38(4):231-3. [Medline]. Leshin B, Whitaker DC. Carbon dioxide laser matricectomy. J Dermatol Surg Oncol. 1988 Jun. 14(6):608-11. [Medline]. Daniel RC, Scher RK. Nail changes secondary to systemic drugs or ingestants. Scher RK, Daniel CR, eds. Nails: Therapy, Diagnosis, Surgery. Philadelphia, Pa: WB Saunders; 2005. 251-61. Rinaldi R, Sabia M, Gross J. The treatment and prevention of infection in phenol alcohol matricectomies. J Am Podiatry Assoc. 1982 Sep. 72(9):453-7. [Medline]. Cordoba-Diaz D, Becerro de Bengoa Vallejo R, Losa Iglesias ME, Cordoba-Díaz M. Effectiveness of standard lavage with supplemental chlorhexidine in patients undergoing chemical matricectomy for ingrown toenails: a clinical trial. J Am Acad Dermatol. 2014 Jun. 70 (6):1092-5. [Medline]. Borovoy MA, Borovoy M, Elson LM, Sage M. Flashlamp pulsed dye laser (585 nm). Treatment of resistant verrucae. J Am Podiatr Med Assoc. 1996 Nov. 86(11):547-50. [Medline]. Bristow IR. The effectiveness of lasers in the treatment of onychomycosis: a systematic review. J Foot Ankle Res. 2014. 7:34. [Medline]. [Full Text]. Ferreira Vieira d'Almeida L, Papaiordanou F, Araújo Machado E, Loda G, Baran R, Nakamura R. Chronic paronychia treatment: Square flap technique. J Am Acad Dermatol. 2016 Aug. 75 (2):398-403. [Medline]. Park SE, Park EJ, Kim SS, Kim CW. Treatment of digital mucous cysts with intralesional sodium tetradecyl sulfate injection. Dermatol Surg. 2014 Nov. 40 (11):1249-54. [Medline]. Esson GA, Holme SA. Treatment of 63 Subjects With Digital Mucous Cysts With Percutaneous Sclerotherapy Using Polidocanol. Dermatol Surg. 2016 Jan. 42 (1):59-62. [Medline]. Hall AF. Advantages and limitations of liquid nitrogen in the therapy of skin lesions. Arch Dermatol. 1960 Jul. 82:9-16. [Medline]. Geronemus RG. Laser surgery of the nail unit. J Dermatol Surg Oncol. 1992 Aug. 18(8):735-43. [Medline]. Olbricht SM. The CO2 Laser: Use as an Ablative Instrument. Ardnt KA, Dover JS, Olbricht SM, eds. Lasers in Cutaneous and Aesthetic Surgery. Philadelphia, Pa: Lippincott-Raven; 1997. 227-61. Ratz JL, Kaye JL, Yetman RJ. The hand. Roenigk RK, Roenigk HH, Ratz JL, eds. Roenigk and Roenigk's Dermatologic Surgery: Principles and Practice. 3rd ed. New York, NY: Marcel Dekker; 2006. 261-70.
de Berker DA, Baran R, Dawber RP. Handbook of Diseases of the Nails and their Management. Blackwell Science: 1995. 33-34: 144-145. Goldminz D, Bennett RG. Mohs micrographic surgery of the nail unit. J Dermatol Surg Oncol. 1992 Aug. 18(8):721-6. [Medline]. Vinycomb TI, Sahhar LJ. Comparison of local anesthetics for digital nerve blocks: a systematic review. J Hand Surg Am. 2014 Apr. 39 (4):744-751.e5. [Medline]. Cepeda MS, Tzortzopoulou A, Thackrey M, Hudcova J, Arora Gandhi P, Schumann R. Adjusting the pH of lidocaine for reducing pain on injection. Cochrane Database Syst Rev. 2010 Dec 8. CD006581. [Medline]. Hogan ME, vanderVaart S, Perampaladas K, Machado M, Einarson TR, Taddio A. Systematic review and meta-analysis of the effect of warming local anesthetics on injection pain. Ann Emerg Med. 2011 Jul. 58 (1):86-98.e1. [Medline]. Cummings AJ, Tisol WB, Meyer LE. Modified transthecal digital block versus traditional digital block for anesthesia of the finger. J Hand Surg Am. 2004 Jan. 29 (1):44-8. [Medline]. Sears JK. The use of a combination nail elevator and hemostat clamp. New instruments for nail avulsion. J Dermatol Surg Oncol. 1992 Mar. 18(3):223-5. [Medline]. Prabhakar H, Rath S, Kalaivani M, Bhanderi N. Adrenaline with lidocaine for digital nerve blocks. Cochrane Database Syst Rev. 2015 Mar 19. CD010645. [Medline].